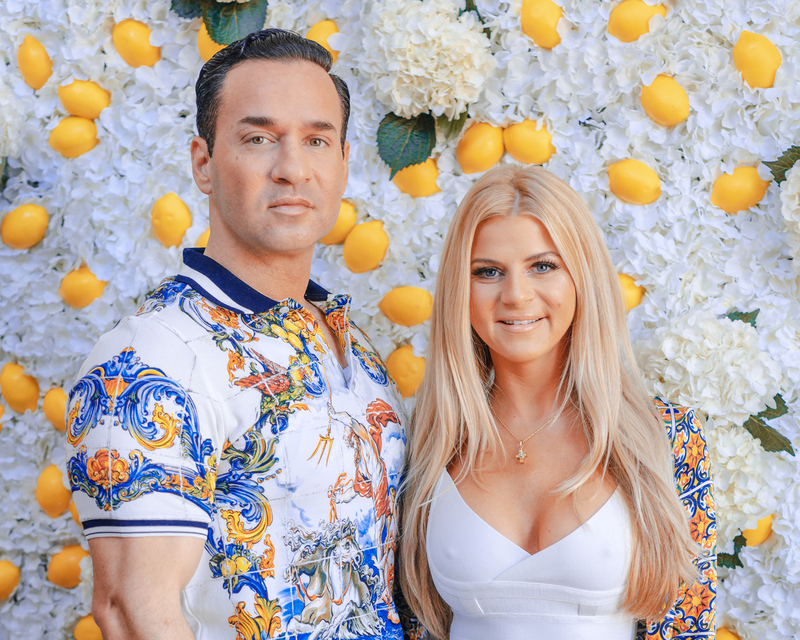 Mike “The Situation” Sorrentino has never been one to shy away from showiness, and on his wedding day, both he and wife Lauren Pesce made a bold statement with their decorative choices. The college sweethearts got married at The Legacy Castle in New Jersey on Thursday, Nov. 1, before 205 of their closest family and friends. At the altar where they exchanged vows, the lovebirds had a giant flower wall made up of blush-colored roses propped up as an eye-popping backdrop for their first kiss and pronouncement as husband and wife. Several floor lights lit up the space, giving their stage an extra special glow. One day prior to the wedding, Pesce, 33, looked like she was trying out her look in front of a different piece, sharing a selfie with fans bearing the caption: “wedding ready.” This installation, however, boasted white flowers with golden centers. Pesce and Sorrentino, 36, are clearly fans of the floral wall trend. In September, the pair celebrated their upcoming nuptials with an Italian wedding shower, complete with a flower wall resplendent with white carnations and bright yellow lemons. Big Daddy Sitch wants to thank Felicia from @rosieposiesmanalapannj in my hometown Manalapan, New Jersey! She brought mine and Lauren’s vision to life with her center pieces— not to mention, that flower wall is a good situation! Pesce and Sorrentino’s wedding was a fun fete that included the entire cast of Jersey Shore (sans Sammi “Sweetheart” Giancolo, who sent a gift in lieu of attending), and even featured Nicole “Snooki” Polizzi and Jenni “JWoww” Farley’s 4-year-old daughters Giovanna and Meilani as flower girls. Be the first to comment on "Mike ‘The Situation’ Sorrentino’s Wedding Included a Serious Flower Wall"